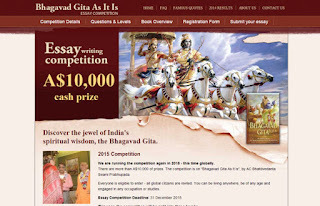 International Bhagavad Gita Essay Competition! ~ The Toronto Hare Krishna Temple! International Bhagavad Gita Essay Competition! Devotees of our community have the opportunity to deepen their appreciation of the jewel of India's spiritual wisdom, the Bhagavad Gita. There is an international competition with more than $10,000 (Australian Dollars) of prizes. The competition is on "Bhagavad Gita As It Is", by AC Bhaktivedanta Swami Prabhupada. Everyone is eligible to enter - all global citizens are invited. You can be living anywhere, be of any age and engaged in any occupation or studies. The essay competition deadline is December 31, 2015.